Fall enrollment at the University of Montana fell 7.6 percent over last year to 10,962 students, though the number of international students jumped 14 percent, school officials announced Friday. The figures, released annually after the 15th instructional day, continue the university’s tumble in enrollment over the past few years, though this year’s drop was predicted based on early indicators. “We had anticipated fewer students, given the number of graduates last spring and over the summer, as well as seeing some troubling early indicators in the spring around the total number of applications,” said Cathy Cole, UM’s new vice president for enrollment and strategic communications. UM marked gains in a number of areas, including a 4.6 percent increase in Graduate School enrollment, and a 3.7 percent increase in students enrolled in the School of Law. The largest increase came from international students, which climbed 14 percent to 717 students. But a 21 percent reduction in students enrolled in Missoula College hurt the overall numbers. Now under new leadership, UM has made a number of internal changes that are expected to reverse the enrollment trend in the coming years. The new “One, Two, Free” statewide initiative that provides two free courses for high school students will also bring more participants to the program, officials believe. 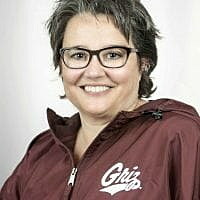 In an August interview with the Missoula Current, Cole said the recruiting class for the fall semester was largely set, and she was eyeing changes for 2019 and beyond. Since arriving on campus this summer, she has worked to expand UM’s recruiting efforts and improve the messaging around what the campus has to offer.